Peanut, peanut butter…and JELLY! Is that a real song or is it just one I made up in my head? I am not sure, but it has a nice tune:) I am very excited about today’s recipe-Peanut Butter and Jelly Muffins. The recipe comes from my good friend Lori’s new cookbook, The Recipe Girl Cookbook. You can’t beat a classic PB and J sandwich. Whenever I am feeling lazy or just in the mood for some good comfort food, I always turn to PB and J. Whole wheat bread, creamy peanut butter, and strawberry jam for me please! It always hits the spot. When I saw Lori’s recipe for Peanut Butter and Jelly Muffins, I knew I had to try them. 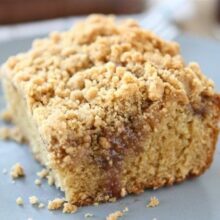 I’ve made a Peanut Butter and Jelly Coffee Cake before and it’s a favorite. I knew I would love the muffins! 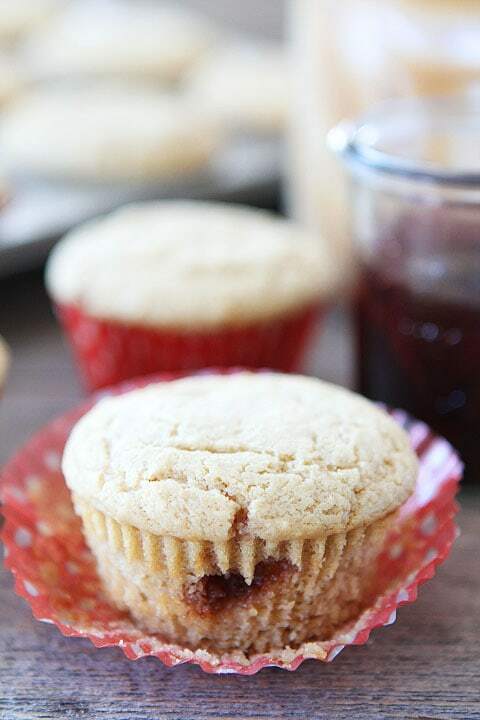 You can’t go wrong with the traditional peanut butter and jelly combo, especially in cute muffin form. The muffins are super simple to whip up. I bet you have all of the ingredients in your kitchen right now! 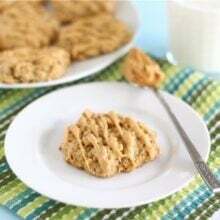 Lori recommends using creamy peanut butter for this recipe. If you use a natural-style peanut butter, just make sure the oils are present to create a moist and tender muffin. I used Trader Joe’s creamy peanut butter. It’s my favorite! I used strawberry jam for the filling because we had an open jar in the fridge and it’s my fave. You can change it up by using whatever jam you like-grape, blackberry, or raspberry would be tasty too! 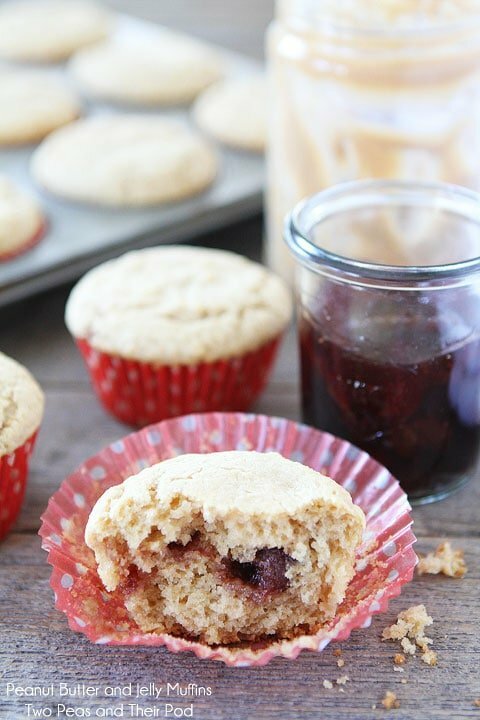 Peanut Butter and Jelly Muffins are great for breakfast or snack time. I bet the kiddos would love these muffins as an after school snack. You can make them for them or let them get in on the action. This recipe is a fun one for kids because it’s easy and what kid doesn’t like PB&J? The next time I am craving PB&J sandwich, I might reach for a Peanut Butter and Jelly Muffin instead. Love these muffins! 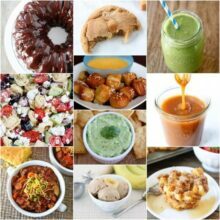 Make sure you check out The Recipe Girl Cookbook. It is filled with family-friendly recipes that are easy to follow. There are also 20 themed party menus that will help make your dinner parties delicious and fun! There are so many recipes we want to try! Congrats Lori! 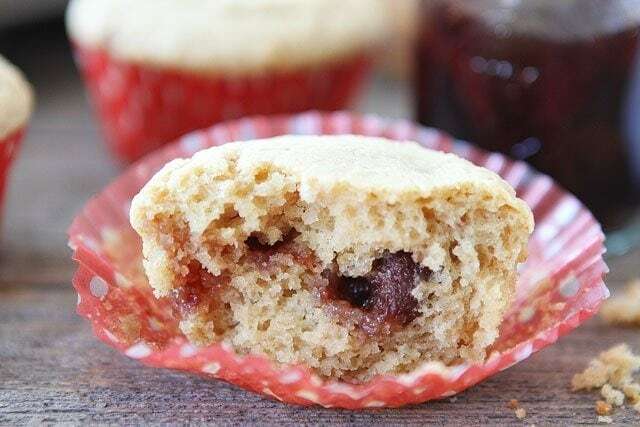 Peanut butter muffins with a dollop of jam in the center. 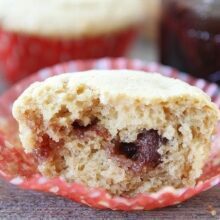 If you are a PB&J fan, you will love these muffins! 1. Preheat the oven to 350 degrees F. Spray 12 muffin cups with nonstick cooking spray or line with paper cups. 2. In a medium bowl, whisk together the milk, peanut butter, oil, egg, and vanilla. Stir the wet ingredients into the dry ingredients and mix just until combined. 3. Scoop about 2 tablespoons of batter into each muffin cup. Spoon a heaping teaspoonful of jam on top of each cupful of batter. Then spoon about 2 tablespoons of batter over the jam. Divide any remaining batter equally among the muffin cups. 4. Bake for 20 to 25 minutes, or until the muffins have risen in the middle and are firm to the touch. 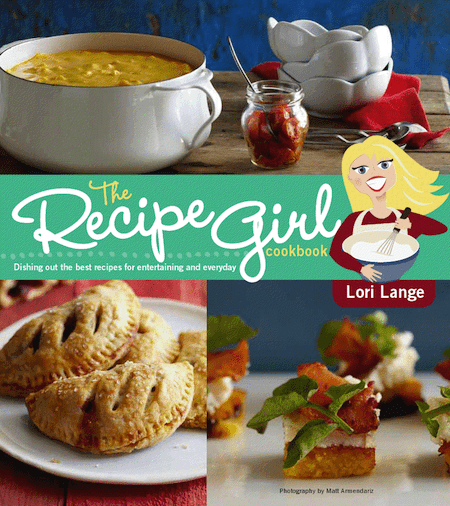 Congrats to Lori on her book…and I love love love that the recipe you chose was a PB recipe..and PB&J no less. They look wonderful! Congrats Lori on her lovely book. I can’t wait to get a copy. Your muffins are looking beautiful! My favorite Jam to use on PB and J is strawberry. I’m so happy for Lori! That is awesome!! I just love her recipes! The muffins look amazing!! Looks fantastic!!! Would love to check it out!!! Definitely adding this recipe to my muffin list! And the new cookbook to my Mother’s Day wish list! i would love a new blender… And the muffin recipe looks fantastic! I am so excited for Lori’s new book! Congrats to her!! These muffins look delicious! These bring back childhood memories! Such a great combo for breakfast muffins! These sound wonderful ! I bet the cookbook is too! Congrats to Lori! My kids would love these muffins. Gorgeous photos, Maria! These muffins look so delicious! Perfect for breakfast or a midday snack. Love me some peanut butter and jelly! I made the buckeye brownies this weekend, they are the bomb. These will be made this week, when I was in high school I ate pbj sandwiches every day. What a cute grown up version! ooh, i just might make these today, I love pbj, can’t wait! PB&J — awesome combination!!! Thank you for the opportunity. Love Lori’s book and these super muffins! Divine pics and easy peasy sounding recipe…will want to try these soon! Can’t wait ti get the cookbook. Will be using raspberry jam instead of strawberry in the muffins!Yum! what a great giveaway! Looking forward to flipping through Lori’s book! Love PB &J and what a great blender giveaway!! Hope the cookbook has many many great recipes! My old blender actually just broke! I need a new one! These are too cute! Can’t wait to get my copy of her cookbook – should be arriving in the mail today or tomorrow! Oh yum Maria!! I can’t wait for Lori’s book! I am heading straight to Amazon to buy it!! Oh I bet those muffins are outrageous! Love Lori’s new cookbook! Yum and hooray for the giveaway. I’ve already made 3 things from Lori’s cookbook and have loved them all. These look equally fantastic! Yum!! This looks fantastic and who doesn’t love PB & J in muffin form?? Love the new cookbook Lori and I wouldn’t mind a new blender either! 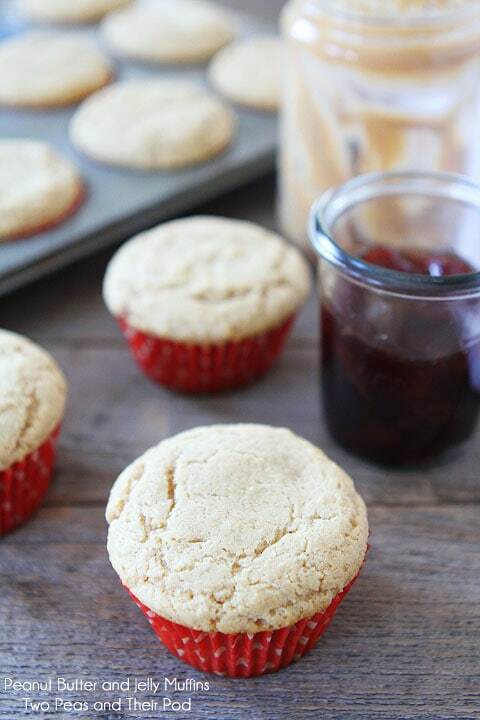 I’m going to try these muffins with cherry jam! Peanut butter jelly TIMEE!!!! I have got to make these happen. That’s definitely a real song! These look so good!! I’ve been eying these in Lori’s cookbook and I think they are going to have to be the first recipe I make from it! I can never turn down anything PB+J-infused! Okay, my son loves that song!! These look great! I can’t wait to make them for my little guy. I’m going to have to make these for my kids this weekend. They’ll love it! Congrats to Lori on her book and thanks for a great giveaway! Wow, these muffins sound delicious! Congratulations to Lori on her cookbook. What an accomplishment! I’m a peanut butter and jelly fanatic. I actually just returned home from the store because I was worried I might run out of peanut butter shortly – can you imagine the drama that could follow? I’m going to drown my sadness in these muffins. you are but certainly you’re going to a famous blogger if you aren’t already 😉 Cheers! I would love to win a new blender. So going to make these muffins asap! The cookbook looks very family friendly and yummy! Hope to try a new blender with it. Muffins look good. Thanks for the giveaway. I just had to comment on that sweet little jelly heart on top of the muffin – love that! These look really amazing! What awesome muffins! Seriously peanut butter and jelly never had it so great! Love Lori’s recipes and think her book looks great. Those muffins will be made this week! So pumped for Lori’s new cookbook!!!! And these muffin looks fab! these look amazing! curious to see if they will work well with whole wheat flour. going to have to whip up a batch very soon! Pb and j is the best! So cool to have it in muffin form. Love how versatile this is too. You could make them over and over with different jams and they’d always taste different. Yum! Love me a PB&J muffin and some coffee too. Lovely post. My favorites together in a muffin so yummy! Can’t wait to try this recipe out! ps – love cookbooks and this is one I would definitely be looking for in the Bookstore! Love PB and J everything! I will try with raspberry! Real song. I sing it every time I make a PB&J sandwich. Great muffins! These look so yummy! P.S. I could use a new blender…our broke! Oh sniff! Fab muffins, I love the jam heart! I looove peanut butter… why not with jam … in a muffin! Yum! Sounds like a perfect after school snack! The muffins look delicious. Plus, I would love to add a KA blender to my kitchen appliances. I need to make these muffins ASAP — they look delicious! Totally a song/chant we always used to have the moves for LOL!!!!!!!! So funny!!! Yum! Can’t wait to make these for my kids with grape jelly!! I love muffins with strawberry filling. I also would love to have the new cookbook in my collection and I could use a new Blender that is not a hundred years old! Thank you for sharing the post and giveaway. A loyal reader. Love this! I’m sure I could have this every morning. And thanks for the awesome giveaway! My favorite jelly to use on peanut butter and jelly sandwiches is apple. Apple jelly tastes AMAZING to me. PBJ— love it and this is one I will have to try. Yum!Yum! Nothing like PB & J!! My favorite PB&J combo is smooth peanut butter and grape jam. I guess I’m kinda boring, huh? I know some grandkids who will love these! I have just found your website and love you recipes. Thanks for the giveaway. A peanut butter and jelly muffin sounds great. My kids would totally love this for an after school snack. Peanut butter and jelly it always remind me of my childhood together with my mom, and now, with my kids. 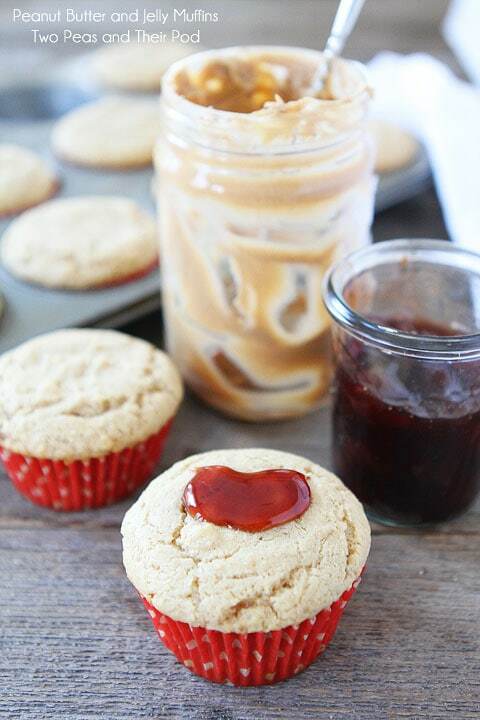 A great job for making PB&J muffin. I just made these so I would have some treats to take to work for a mid-morning snack, and I decided they smelled too delicious to wait until tomorrow to eat…all I can say is WOW…these were delicious – especially if you eat them while they are still warm with a glass of milk! Pingback: Recipe Girl Cookbook Giveaway + $100 Amazon Gift Card | Weight Loss & Wellbeing. a very good article and I actually was extremely glad to discover the article. Just put these in the oven and can’t wait to see how they turn out!!!! I noticed the recipe calls for 1 tablespoon of baking powder…. I’m a novice baker, but I was too nervous to use that much and subbed 1 teaspoon instead! Is 1 tablespoon correct?? Can’t wait to see how these muffins turn out! The house smells yummy!!! That is the correct amount! They are AH-MAZING!!!!!!! Hubby LOVES them!! What a great, healthy muffin!!!! I need to pick up Lori’s cookbook! !